A small design in Bulgarian dedicated to May 24 .Bulgaria celebrates May 24 as the day of the Bulgarian Alphabet,Education and Culture. 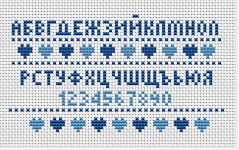 Cross stitch sampler of the Cyrillic alphabet (Bulgarian). Cyrillic script is one of the oldest, and one of most widespread alphabets in the world. 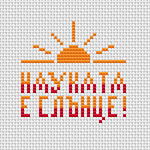 A stylized pattern of sunrise or sunset for 14 count white fabric.Contains only full stitches. Single blue flower blossoming under the sun and the text: Life is good. 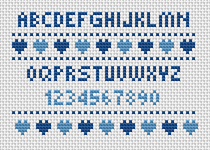 Cross stitch alphabet and digits with character height of 6 stitches. 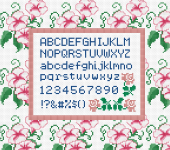 Suitable for stitched cards, quotes or other crafts projects. Geometric ornament with hearts and a star for your Christmas projects. 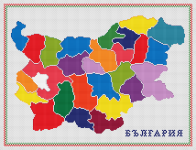 Administrative map of Bulgaria in bright colors. 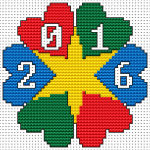 Contains full stitch and backstitch. A cross stich pattern of a Mermaid for all the girls that feel a Mermaid inside themselves. The first three letters of the Cyrillic alphabet depicted next to a flower. Abstract pattern of a vase with flowers in muted, brown colors.